The new catalog for "compact thermal imaging cameras" is now available and includes all current thermoIMAGER TIM models. The range has even increased with many new products. The new catalog based on the theme of "compact thermal imaging cameras" is now available online and as printed matter. Detailed specifications of each camera and numerous graphics provide a comprehensive overview of all TIM products currently available Micro-Epsilon. Many new products such as the thermoIMAGER TIM M1, G7 and 640 thermal imaging cameras are included. Thermal imaging cameras recognize, detect and measure the temperature on a surface. Due to their high thermal sensitivity, the infrared TIM cameras are ideal for precision measurement tasks. Different performance classes enable a suitable model to be selected for every application. The camera is connected via a USB interface, which also supplies the power. 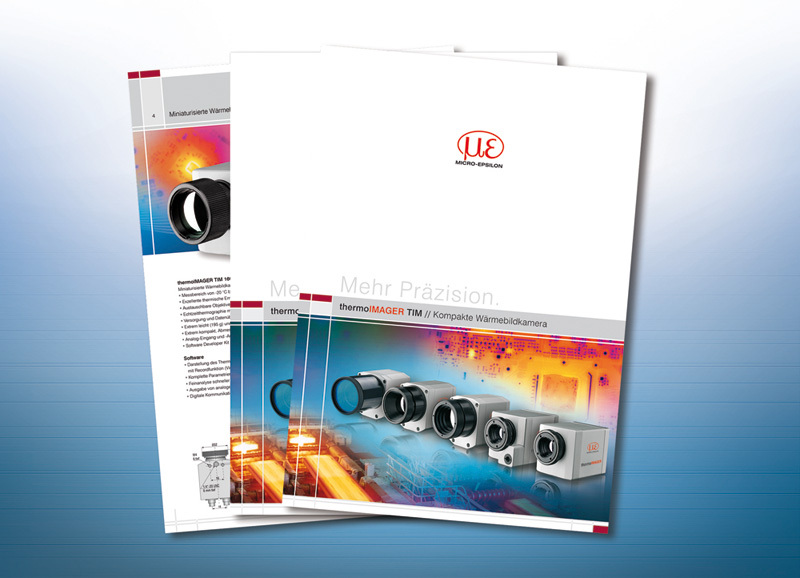 The new catalog includes detailed product descriptions of all available infrared cameras, as well as accessories such as PCs, interfaces and cooling jackets that enable the camera to operate in ambient temperatures up to 315°C. Technical details and application examples round off the catalog.